The Stem label produces experimental and minimal electronica in a 5.1 surround audio or audiovisual DVD format. 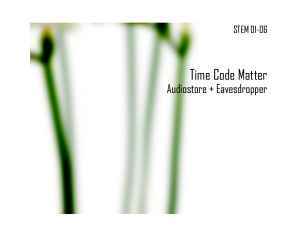 Time Code Matter is a performance by Audiostore & Eavesdropper in which audio organisms hover in the vast darkness surrounding the audience, take a quick snap at some spectators, and then they die off. Supported by the Flemish Community, with thanks to W.P. Zimmer and Concertgebouw Bruges, Masda for mixing and mastering facilities and all friends and partners involved. This DVD contains a remix for a 5.1 channel setup and a stereo version. great sounds in a special soundworld ! also special for a total surround expierence ,it's if you are a live with this happening !!!!! !